Saudi Arabia has released the Saudi-Ethiopian businessman Mohammed Hussein Al-Amoudi following more than 14 months of detention in a nation-wide crackdown on corruption, official Ethiopian Broadcasting Corporation (EBC) reported yesterday. “The Saudi authorities released Al-Amoudi on Sunday after Ethiopia’s Prime Minister Abiy Ahmed had pressured the kingdom’s Crown Prince Mohamed Bin Salman to release the largest investor,” EBC said. 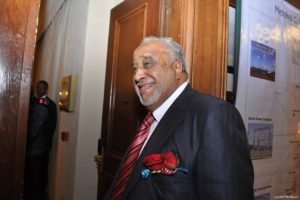 Al-Amoudi was among scores of Saudi businessmen and government officials rounded up in Riyadh’s Ritz-Carlton Hotel in November 2017 as part of Salman’s alleged anti-corruption campaign. His release came following the acquittal of five other Saudi businessmen last week and also after the kingdom has been suffering a global backlash over the murder of the Saudi journalist Jamal Khashoggi, who was killed in the Saudi consulate in Turkey’s Istanbul. Born in Ethiopia and raised in Saudi Arabia to a Saudi father and an Ethiopian mother, Al-Amoudi was called by Forbes as the wealthiest man in Ethiopia and the second-richest in the kingdom. In 2016, the American magazine valued his fortune at more than $10 billion.